Jake Duffy scored from a free kick for Stamford against Spalding. It was honours even in the big derby in Division One South of the Evo Stik League yesterday (September 2). 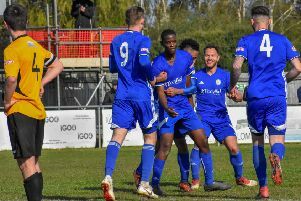 Stamford and Spalding fought out a 1-1 draw at the Zeeco Stadium in front of 276 supporters to continue their middling starts to the league campaign. Andrew Tidswell hit a hat-trick for Pinchbeck United. Devante Reittie grabbed a debut goal for Spalding midway through the first-half before Jake Duffy equalised within 10 minutes with a deflected free-kick for the Daniels. Across the town Blackstones lost for the first time in United Counties Division One this season as Irchester left with a 2-0 win. Adam Rothery scored twice in a 5-2 win at Olney in the same division, while fellow Division One side Pinchbeck thrashed top-flight St Andrews 10-1 in the League Cup with Liam Ogden and Andrew Tidswell bagging hat-tricks. Peterborough Northern Star were well beaten 4-1 by Newport Pagnell in the Premier Division. Matthew Barber scored the city side’s goal against a side who have won their opening four matches. There were defeats for March and Wisbech St Mary in Division One of the Thurlow Nunn Esatern Counties League. Newport Pagnell 4, Peterborough Northern Star 1 (Barber). Blackstones 0, Irchester 2; Long Buckby 0, Huntingdon 5; Olney 2, Bourne 5 (Rothery 2, McDonald, Pearce, Goldson-Williams). Pinchbeck United 10 (Tidswell 3, Ogden 3, Maltby 2, Withers, Smith), St Andrews 1. Wisbech St Mary 2 (Friend, Sewell), King’s Lynn Reserves 3; Whitton United 2, March Town 0.